UJV 325, also known as Wahoo - N 9, is an ultra modern, 2-bedroom apartment. 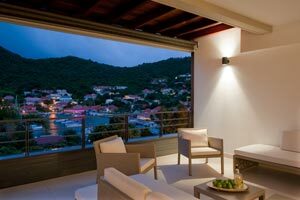 UJV 325 is ideally situated in the heart of Gustavia, and offers fabulous harbor views. The master bedroom has a king bed and an ensuite bathroom with shower. The 2nd bedroom is slightly smaller, with ensuite bathroom with shower, but no w/c - the w/c is located off the hallway, and also serves as the guest half bath. The spacious living room is comfortably furnished, and is open to the ultra-modern kitchen, where most appliances are hidden from sight behind elegant panels. Both kitchen and living room open up to the large terrace which has a dining and seating area overlooking the harbor. The apartment has a private parking space in the garage below the building, and is within easy walking distance to shops, restaurants, and Gustavia night life! This apartment is ideal for people who like to spend time in Gustavia, and who appreciate upscale, modern living.